It’s been awhile since we’ve made a Dorie ice cream concoction. Well, allow me to make up for lost time by presenting you with a slice of Coffee Ice Cream Tart. While you could very successfully use softened store-bought coffee (or any flavor, for that matter) ice cream in this tart, I went ahead and made my own. I have lots of yolks in the freezer, and anyway, ice cream is one of my favorite things to make. The ice cream is jazzed up with almond slices and extract, and the coffee-almond combo is a good one. Add a little chocolate and it’s even better. The crust was a little iffy, though, and it looks like several of us felt this way. Mine sliced fine, but it was awfully hard to get through the frozen crust with a fork. I had to resort to picking it up and eating it. Not terrible, but maybe I just prefer ice cream cakes to tarts? For the recipe, see Baking: From My Home to Yours by Dorie Greenspan or read Domestic Deep Thought, as it was Jessica’s pick this week. Don’t forget to check out the TWD Blogroll! Homemade ice cream would send this treat over the top! You are very good making your icecream as well – I just used the store bought vanilla I already had. Love your disc of chocolate on top – makes it doubly delicious! Yolks in the freezer?? Tell me about yolks in the freezer!! Your tart look amazing! I love that chocolate circle suspended in the middle! Absolutely beautiful! I can’t believe you made your own ice cream! Thanks for baking with me this week! Chocolate, coffee and ice cream!! It doesn’t get better than that. Looks delicious! Wow, that looks great! I’ve made ice cream a couple of times but since I don’t have an ice cream maker it takes forever. I didn’t make the recipe this week but I just might have to now. I’d eat that ice cream tart with my hands. In a heart beat! Wow, Steph….beautiful tart! Nothing compares to homemade ice cream…awesome you did that. It looks pretty darn good!!! Wow!!! Oh, wow, I should have done that with the chocolate on top, that looks great! I can’t drizzle so mine was disaster, no need for you to venture of this week to check it out unless you want to squeal with laughter and lose all respect for me. Seriously. Mark loved the taste of it, however. Kudos on making your own ice cream this week! I took the easy way out & bought some, mainly because my freezer is so jam-packed I can’t fit my ice cream canister to freeze it 🙂 Love your pic – the tart is gorgeous! 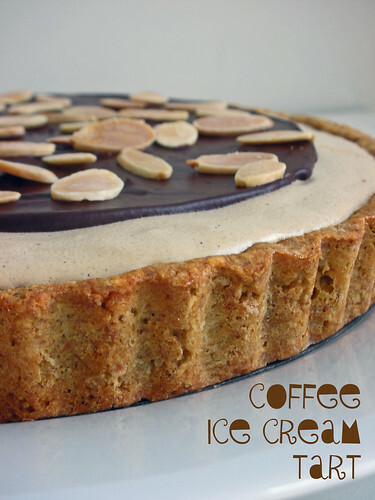 Your coffee ice cream tart looks amazing! love that chocolate ganache layer on the top. beautiful!